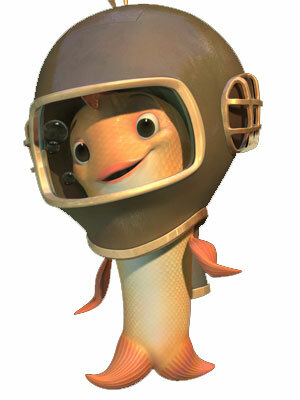 It’s another new fish out of water paper! I’ve written about terrestrial fish, and fish the beach themselves for long times. 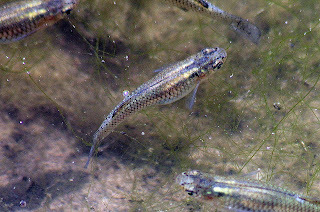 Mosquitofish (Gambusia affinis) don’t take their air time as seriously: they seem to use land as refuges for short times, and then flip back into water. But while on land, they have to jump to get around, and eventually back into the water. 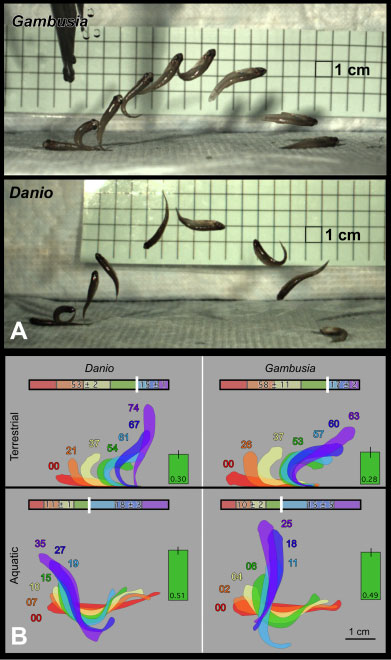 In a nice little paper, Gibb and colleagues describe the jumping behaviour of these fish on land. To test if mosquitofish have any particular behavioural specializations for this jumping behaviour, they also tested zebrafish, which nobody has ever reported routinely jumping out of the water. To my surprise, once on land, these two fish species showed no important differences in the jumping behaviour. The mosquitofish took off at a slightly lower angle, and didn’t tumble as much as the zebrafish, but the similarities between the fish are much greater than the differences. One possibility is that the neural circuits involved in this behaviour are the largely the same as those responsible for rapid escape responses (C-starts). These neurons are well known, and involve famous giant neurons called Mauthner neurons. It would be interesting to see if the neural circuit is perhaps a pre-adaptation for these jumps on land. 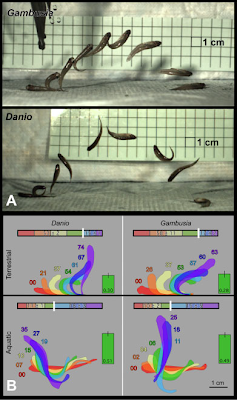 This paper shows that C-starts are different in the timing of their movement than the jumps on land, but that does not completely rule out the involvement of some of the same neurons in bothe behaviours. How widespread is this ability to move around on land, even if not much better than hit-and-miss flopping around? Mosquitofish and zebrafish have been separated for a long time, so most fish might be able to jump on land in a coordinated way. Photo by davidhofmann08 on Flickr; used under a Creative Commons license.